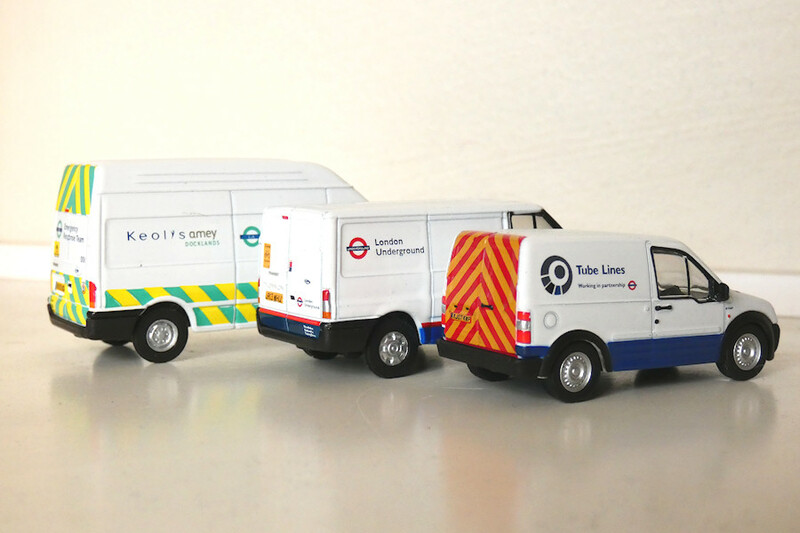 Details: A rear view of the three Oxford Diecast Ford vans in LTSV-related liveries. A couple of points about the Transit Connect (on the right here) are questionable. The Tube Lines logo looks to be too large, that on the nearside being more correct. The rubbing strip has been painted white, whereas 6144F was one of few Connects to not actually have a strip. This is fair enough, given that the strip is part of the casting. Finally, I don't believe 6144F had rear chevrons, although I do not have photographic evidence. These minor quibbles aside, the models are really rather good, and more are on the way including unique Land Rover Freelander 7429LR, and a Transit dropside and Transit Connect both in LUL livery. Older Ford marques (such as the Cargo lorry and Transit Mk.3/4) are also available from Oxford, so these could form the basis of future SV models.